The name Astro-Physics has come to represent cutting edge optics, unadulterated performance and reliability, and with a waiting list for their telescopes that extends for years. Even though Astro-Physics places few advertisements, their legend has continued to grow in the best way possible - by positive public critical acclaim. And to its credit, no other product line has achieved such a large installed base of clientele using this class of premium products: their telescopes and computer controlled "Go To" German Equatorial Mounts. These have been proven to be superb products not only in published reviews and by our own estimation, but by the positive work published by their more demanding consumers. In fact a number of famous and awesome astrophotos (CCD and film) taken over the past decade or more have been accomplished by a number of Astro-Physics telescope owners. People often pay inflated prices to acquire a used Astro-Physics product (this happens with no other product line) just to have a chance to own that which most consider to be the best products in their class; this flattering inflation of prices while unwelcome, happens with no other products in this industry. The first 1200 mounts were shipped in late 1992. Each new generation has brought with it successive development in mechanical construction and the drive systems, evolving each time to meet the needs of the most advanced amateurs. It has been in part because of the numbers of these systems being used over the past decades with the frequent interaction with Astro-Physics between its customers, friends, testers, and with Company Seven that has led to this product line becoming so advanced, so quickly. And the fact that Astro-Physics is able to manufacture the quantities of these superb products completely in house helps to constrain prices and make them not only technologically advanced and desirable, but also comparatively affordable. Well just as the telescope determines what can be seen or imaged, it is the mount supporting the telescope which determines how the telescope can be used. To match the potential of their telescopes Astro-Physics has developed and refined a series of German equatorial mounts which now culminate in the present revision of the 1200GTO, their highest capacity one man transportable tracking platform. These refinements and engineering firsts come at breakneck speed from Astro-Physics since they have developed such a large following of advanced users of the product, and Astro-Physics has established an observatory at their own factory to help with research and development efforts. Considering the volume of constructive data returned by their customers to the factory from around the world, in all climates and most latitudes, and with their own unrivaled experience in this area (published photos prove these are not "armchair astronomers"), it is no surprise that for 2004 the factory is yet again growing to try to meet yet increasing demand that hitherto has kept people in line for their products. 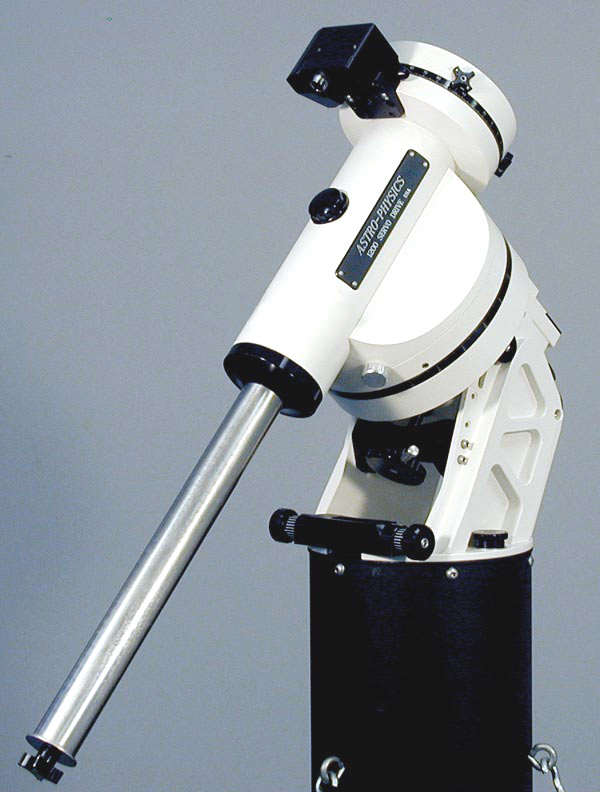 The 1200GTO Astro-Physics equatorial mounts are designed for solid stability a high pointing and tracking precision under a variety of observing conditions. At the same time, the mounts are engineered so that amateurs can transport them to their favorite dark-sky site, set them up quickly and accurately. The mountings break down into manageable sizes, but when set up they are extremely rugged and steady platforms. These are an extremely solid, rugged, high payload mount and yet the equatorial head comes apart in two reasonably light-weight components for hassle-free field setup. No tools are needed to assemble the mount in the field. 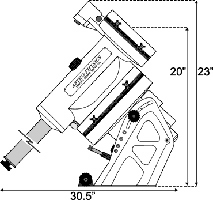 Using modern CNC machining techniques, all components are made to a high precision level, which results in a final package that is solid and accurate in all respects. The critical angles are accurately machined so that the mount is orthogonal to a very high degree. This also results in Go To pointing accuracies well below 1 arc minute for a properly aligned mount. Astro-Physics has also developed a very accurate worm gear set and state of the art electronics technology to insure smooth, effortless finding and tracking of celestial objects for all visual and photographic purposes. Critical worm gear accuracy is maintained by special machining techniques developed at Astro-Physics after extensive studies and actual field operation. Astro-Physics worm accuracies are second to none and are guaranteed to be 5 arc seconds or less, peak-to-peak. The periodic error of each mount is verified during extensive testing procedures. And all of this is complemented by their high degree of durability and reliability. With good alignment and PEM training, it is quite practical now to achieve unguided CCD images with today's hi-resolution cameras coupled to a 6 to 16" telescope. The Astro-Physics GTO mount has proven itself to be reliable even in the most severe environment on the planet while functioning flawlessly 24 hours per day throughout the entire polar night - a night lasting 6 months. With few modifications these are carrying a telescope in Antarctica for planetary research. Once the mount is installed and the polar night begins, no maintainance can be done to the mount due to the extreme low temperatures and dangerous wind conditions that prevent technicians from working outdoors. 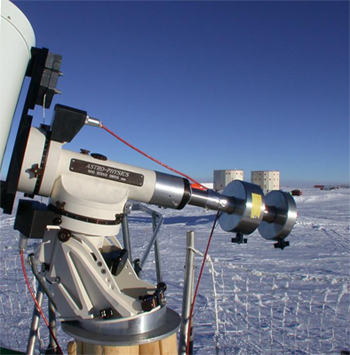 Right: Astro-Physics 900GTO Computer Controlled German Equatorial Mount in Antarctica (94,995 bytes). Note custom Latitude Wedge betweenthe mount base and pier required to attain proper Pole Alignment elevation here. Click on image to see enlarged view (284,412 bytes). We invite you to see the new 1200GTO at Company Seven's showroom or contact Company Seven, the Americas only full line Astro-Physics showroom! e of the factory where we show their full product line. Right: Model 1200 GTO Mount Head West side. Also shown are optional Pier Adapter and Pier (80,491 bytes). Click on image for high quality, enlarged view (133,089 bytes). This one-piece assembly makes azimuth adjustment easier and more accurate for precise polar alignment in your observatory or in the field. The heavy-duty construction and integrated one-piece design results in smooth control of the azimuth axis. Large left and right adjuster knobs are graduated for precise control of azimuth position angle. The small graduations are 1.3 arc minutes per graduation; long graduations are 6.5 arc minutes per graduation. The size of the knobs makes them easy to turn with very little torque required, even with the mount fully loaded. increased height of the polar forks allow more room for your hand when making altitude adjustments and tightening knobs. Also eliminated the sharp corner to prevent cords from catching. improved the gear profiles of the motor gearbox, so slewing is noticeably quieter. Amount of backlash delay in the motor gearbox has been reduced so that declination reversal occurs almost instantly. These gears are made by the same company that supplied NASA with the drive gears on the Spirit and Opportunity Mars Rovers; they have also produced components for the space station. will provide both clutch knobs and alternate special setscrew substitution. If you are concerned about cables catching on the knobs, use the setscrews in their place. motor bracket has built-in spring to keep the worms loaded at the proper setting. This new Rotating Pier Adapter with Azimuth Bearing (P/N S1200RPA) allows you to lock the mount down with no need to loosen the base during azimuth adjustment. Especially recommended for use in the field. GTOCP3 Servo Motor Control Box. The new control box has increased protection on all input lines, larger capacity memory chip, and additional commands for mount control. GTO Keypad. This unique keypad has evolved over the last year or so to include a new circuit board with larger memory capacity, LED fiber optic backlit panel for greater longevity and quieter operation and epoxy coated elastomeric keys. The Keypad Protector is now included as standard with all keypads. With the advent of the CCD camera, amateurs are exploring the skies to an ever increasing level of precision, easily exceeding the image quality of large observatories using film techniques decades ago. This new level puts a higher demand on the precision of the equatorial mounting. Many of the finest imagers today have been using our Astro-Physics GTO mounts as a solid platform for a wide variety of instruments. The largest of these is our 1200GTO. Right: 10" Mak Cass on Astro-Physics 1200 GTO German Mount supported by Particle Wave Technologies Pinnacle model tripod (90,261 bytes). Click on image to see enlarged view (123,402 bytes). Since its introduction in 1998 the 1200GTO model has earned a reputation for both tracking and pointing accuracy, essential to casual visual observation as well as advanced imaging. Quite a few 1200GTO and 900GTO (smaller cousin) mounts can be found at Mount Pinos in California, favorite observing site of many advanced photographers and imagers. Pickup any astronomy magazine, or visit the Cool Sites and Gallery sections of the Astro-Physics website to see photos of the mount in action and images taken while using the 1200GTO. These mounts are truly a marvel of engineering - maximum strength and rigidity with minimum weight. Our CNC lathes and mills carve out the excess material in both axes of the 1200 and 900 series German Equatorials while retaining a heavily ribbed structure for internal strength and rigidity. A unique dovetail was machined into the mating surfaces of the R.A. and Dec axes. This feature allows quick and easy assembly in the field without any tools. The 1200GTO equatorial head is equally at home in a permanent observatory or as a portable mounting for remote star parties thanks to the ease with which the two axes come apart. You CAN have it all. 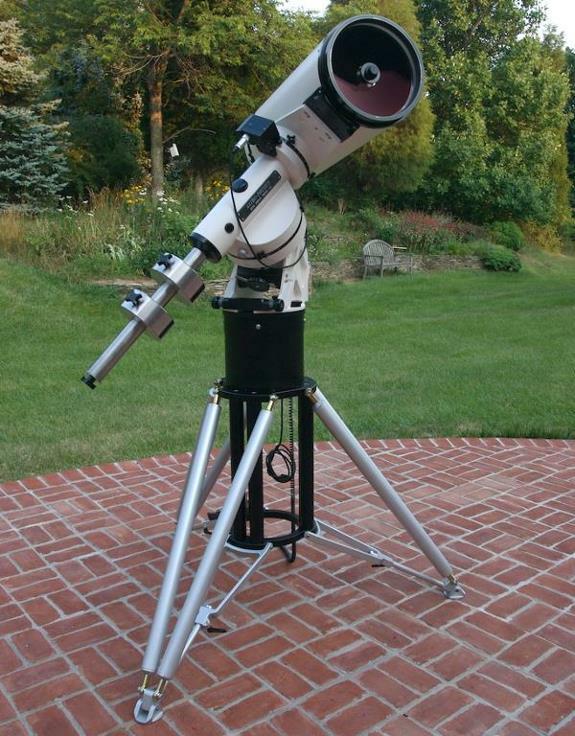 This is the perfect mount for a refractor, Newtonian, Cassegrain or astrograph. Telescopes commonly used on this platform include Astro-Physics 155 to 206mm refractors, 12 to 16" Schmidt-Cassegrains and 10 to 16" Ritchey-Chretiens - though some lightweight versions of even larger instruments are at home on the 1200GTO. Optional 27 inch long Counterweight Shaft available. This GTO means an external computer not needed. The keypad is a handheld computer with all of the features, functions and databases you need to tour the universe night after night. The unique software allows you to precisely polar align your mount in the field, even in broad daylight! The vacuum-fluorescent display with a temperature range of -40 degrees F (and C, they are the same in this instance), allows hardy observers to use this mount on cold winter nights. You can't do that with a PC! Software Bisque's suite which includes TheSky Astronomy Software, CCDSoft CCD Astronomy Software, TPoint Telescope Pointing Analysis Software and Orchestrate Scripting Software. Any software that is ASCOM compliant. or, write your own computer program since the Astro-Physics GTO protocol is freely available to those who would like to write their own computer program for controlling the mount. Clutches and setting circles are provided allowing manual operation if power is not available. 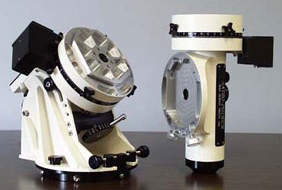 Right: Similar Model 900 GTO Mount Head Taken Down for Travel; East side of R.A. Axis at left, Declination Axis at right. Shown without Counterweight shaft or optional Mounting Plate or Saddle. Note hogging of aluminum into ribbed pattern for rigidity and lightweight (53,162 bytes). Weight of equatorial head: 81 lbs (36.7 kg). Length of standard Counterweight Shaft: 18 inches (XXXXXXX). Weight of standard Counterweight Shaft: 14 lbs (6.4 kg). Length of optional Counterweight Shaft: 27 inches (XXXXXXX). Right: Diagram of 1200 GTO dimensions commonly requested. If the telescope is horizontal and pointing to west or south, then the measurement from the top of the pier to the middle of the cradle plate is 11.25 inches (28.6cm); these dimensions will vary somewhat depending on your latitude. We quote thus for 42 degrees because that is the latitude of the factory, it is also a good average value (21,879 bytes). For more information about Pier Dimensions, read "Head Base and Pier Specifications"
The drive system uses a high-quality Swiss DC servo motor controlled by a microprocessor to guarantee an accuracy of 0.05 arc seconds per step. Tracking is very smooth, noticeably smoother than any stepper motor drive or inexpensive servo drive. The system can be accurately controlled over a speed range of 4,800:1 which allows 0.25x sidereal for guiding to 1,200x sidereal for 5 degree per second. The circuit draws only 0.4 amps when tracking the stars, 2 amps with both motors slewing and requires only 12 volts to operate. This servo drive will satisfy the requirements of the sophisticated, advanced astrophotographer, yet is easy for the casual, visual observer to use. Please refer to GTO Control Box and Keypad for Servo Drive for additional information. Power requirements: 12 Volt D.C. In previous production production runs, the Standard Pier Adapter was included with the 1200 mount however, there are now two options available for your consideration. If you plan to have multiple pier installations, perhaps one permanent and another portable, you may wish to purchase an extra adapter to install on the the second pier. This will make your setup and switchover much quicker. Many customers have found this to be advantageous. 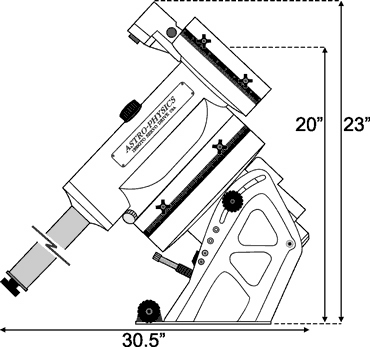 Standard Pier Adapter (1200SPA) This 1200 Pier Adapter is similar to those that which we have included with mounts in the past, however the azimuth adjustment block is slightly taller to accommodate the new azimuth adjustor assembly. If you have a permanent installation, this base is a good choice since you will not have to set up every session. The adapter includes the machined flat plate, four machined aluminum lock knobs with washers, the azimuth adjuster block, center pivot screw and six 5/16-18 x 5/8 side bolts and washers. All machined parts are black anodized and the fasteners are stainless steel. The adapter plate will either fit into your Astro-Physics Portable Pier and be bolted from the side or you can bolt it to the top of a flat surface. Refer to the diagram for bolt pattern information. If we ship an Astro-Physics pier to you at the same time that your mount is shipped, the Pier Adapter will be installed on the pier prior to shipment for your convenience. If you plan to use an ATS pier, the O.D. of the plate will be modified by ATS for an additional charge. Rotating Pier Adapter with Azimuth Bearing (1200RPA) This pier adapter was designed for very accurate and smooth adjustment of the azimuth angle without loosening the lock-down knobs on the base of the mount. Upgrade your previous model 1200 mount (any version) and enjoy the ease of use. The adapter includes two machined flat plates, four machined aluminum lock knobs with washers, a tall version of the azimuth adjuster block, center pivot screw and six 5/16-18 x 5/8 side bolts and washers. All machined parts are black anodized and the fasteners are stainless steel. The adapter plate will fit into your Astro-Physics Portable Pier and be bolted from the side. If we ship an Astro-Physics pier to you at the same time that your mount is shipped, the Pier Adapter will be installed on the pier prior to shipment for your convenience. The Rotating Pier Adapter must fit inside another part and be bolted from the side. It cannot be bolted through the top as you can with the Standard Pier Adapter. A special part will be required to attach this adapter to a flat surfact. Astro-Physics will offer this adapter as an option. Details forthcoming. If you plan to use an ATS pier, the O.D. of the plate will be modified by ATS for an additional charge. PulseGuide is a stand-alone Windows (98, ME, 2000, NT4, XP only) utility that provides complete remote control of Astro-Physics GTO400, GTOE600, GTO900, and GTO1200 mounts. It derives its name from its most distinctive feature, pulse guiding, which can improve unguided tracking. Specifically, it can help correct tracking errors caused by polar misalignment and atmospheric refraction. You can also train PulseGuide to track objects moving relative to the stars, such as asteroids, comets, and the moon. In addition to pulse guiding, PulseGuide also has many useful utility features. With just a few exceptions, it supports the entire serial Astro-Physics command protocol. PulseGuide was written by Ray Gralak of Sirius-Imaging. Please refer to his website http://www.gralak.com/PulseGuide/ for further developments and enhancements. The software will be provided on a CD-ROM with your 1200GTO mount. Previous owners of any Astro-Physics mounts can download the software free-of-charge, courtesy of Ray. Many, many thanks to Ray for this powerful program. The diagram shows several dimensions that are commonly requested. In addition, if the scope is horizontal and pointing west or south, the measurement from the top of the pier to the middle of the cradle plate is 11.25". Note that these dimensions will vary somewhat depending on your latitude. We quote them for 42 degrees because that is the latitude of Astro-Physics and all of our equipment is set up that way. It is also a good average value. *	Portable Pier - 10" diameter, heights 24",32",42",48",54",62"
Portable Piers: 10" diameter with heights 24", 32", 42", 48", 54" or 62"
Stainless Steel Counterweights of 10 or 18 lbs. resistant construction, combination lock, Fedex/UPS label plate. 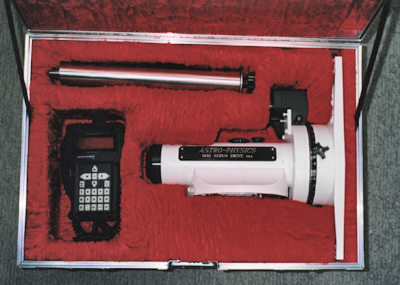 Above: Astro-Physics Model 900 Mount in optional Company Seven ATA case. Case 1 of 2 shown here, with Declination housing (left side shown) with GTO Keypad Controller and Counterweight Shaft (94,326 bytes).